We left the Gustavus Inn to join Captain Mike Nigro on the Kahsteen, his 42-foot charter boat, for a two-day excursion in the Glacier Bay Wildlife Preserve. 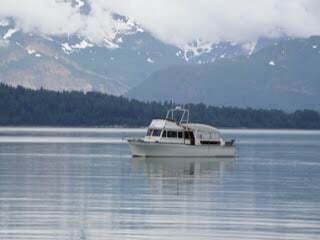 Captain Mike named the Kahsteen after a Tlingit woman who sacrificed herself to save her clan after a young girl foolishly called down the glacier. Someone had to stay behind when the glacier came looking for the person who called it. They believed that Kahsteen continued to live under the glacier and that the sparkles in the water from the falling ice were her children. 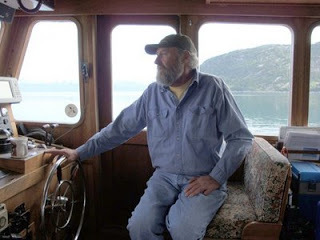 Captain Mike, a former Park Service ranger and commercial fisherman, has operated boats here for over 30 years and he knows his territory. 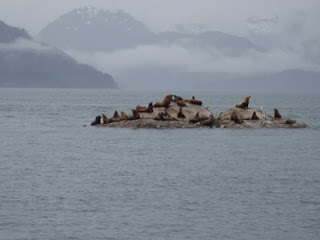 He took us to a place where the sea lions hauled out on the rocks and one where the water was dotted with otters. We visited a bay where we saw humpback whales spouting and flashing their tails. We saw bears, and eagles, and a lone wolf on the shore. We anchored in secluded coves where we watched huge chunks of ice break off the creaking and groaning glaciers and splash into the sea with a great boom that the native Tlingit called white thunder. The whole structure above the dark area on the glacier, which Captain Mike estimated to be the size of a 10-story building, came crashing down as we watched. Most of the time we were completely alone, as the bigger boats and cruise ships couldn’t come into these places. I had the feeling that we were seeing everything just as it looked to the first inhabitants and to the early navigators who explored here. 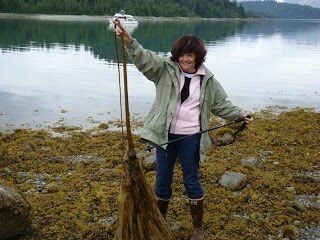 On shore, Pat found a sample of the kind of kelp used for pickles at the Gustavus Inn. The long tube is sliced crosswise and cooked with sugar to make very crisp, sweet pickles. 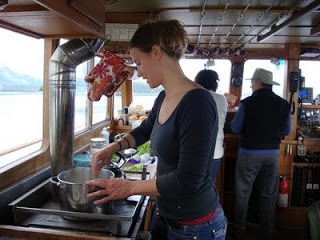 Captain Mike’s daughter, Megan, a natural beauty as well as a natural cook, kept us well-fed and happy on our cruise. 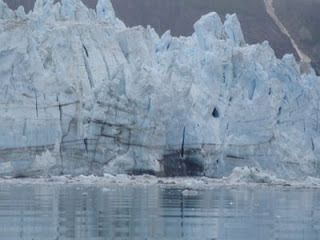 More pictures of Glacier Bay, Mike, and Megan are available on the Kahsteen Website here: http://www.gustavusmarinecharters.com/kahsteen.php and on the National Park Service site here: http://www.terragalleria.com/parks/np.glacier-bay.html. Next: Our first of many close encounters with a bear and very expensive pizza. Alaska, Captain Mike Nigro, Charter boat trip on Glacier Bay, Folklore of the Thingit, Kelp pickles, Private jet reip, The Khalsteen. Bookmark.